File image of SJPD patrol car. A suspect was arrested on suspicion of driving under the influence after rear-ending a San Jose police patrol car early Tuesday morning, according to police. 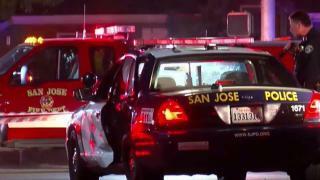 An officer was stopped at the intersection of Camden and Union avenues at 2:51 a.m. in a patrol car when he was rear-ended by the suspect's vehicle, according to San Jose police Officer Gina Tepoorten. The suspect was taken into custody on suspicion of DUI and was booked into Santa Clara County Jail, but police have not released the person's name. No further information about the case was immediately available.